The Information Technology Infrastructure Library (ITIL) defines the organisational structure and skill requirements of an information technology organisation and a set of standard operational management procedures and practices to allow the organisation to manage an IT operation and associated infrastructure. The operational procedures and practices are supplier independent and apply to all aspects within the IT Infrastructure. ITIL is a Service Management Process developed by the Office of Government Commence (OGC) from best practices in IT Service management. The IT Infrastructure Library® (ITIL) is the most widely accepted approach to IT Service Management. * improved delivery of third party services through the specification of ITIL or ISO 20000 as the standard for service delivery in services procurements. 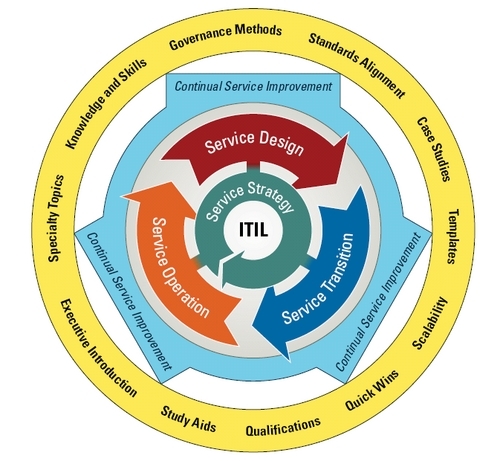 An alternative to ITIL is the Microsoft Operations Framework (MOF) .